Zitac Tablets can be used for the symptomatic treatment for the reduction of vomiting associated with chronic gastritis in dogs. 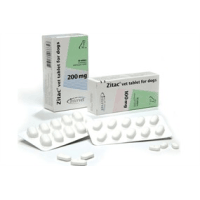 Zitac tablets should be administered orally and can be split to facilitate dosing. Zitac scored tablets contain cimetidine which reduces gastric acidity leading to reduction of vomiting associated with chronic gastritis in dogs. This prescription medication should be administered three times daily by the oral route, using 5mg of cimetidine per Kg of bodyweight.